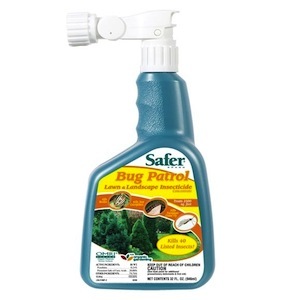 One of GardenSmart’s sponsors, Safer®Brand, brings you a variety of effective insect control products that are gentler on the environment. Most of them proudly display the OMRI Listed® organic seal and comply for use in organic gardening. Along with using products that cause the least harm to the environment, organic gardeners feed the soil so that it will feed the plants grown in it. The environment consists of the millions of microbes that live in the soil and keep it healthy. You need to nurture earthworms, too, so that they continue their tunneling, which provides much needed air space and fertilizer. However, when we talk about the environment, we are not just talking soil. Organic growers are friends to the natural world. This means they only use pesticides when absolutely necessary and only one that will cause the least amount of harm to the environment. 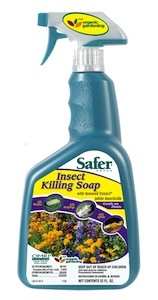 My go-to spray when some unwelcome bug decides to eat my plants is insecticidal soap. It kills on contact and breaks down in the environment without doing any harm to the plant, crop, or soil. There is no residual effect. This means that once it dries on the plant, it will not continue to kill any visitors, so it won’t kill the butterflies and bees I want to invite into my garden, as long as I don’t spray while they are flying. That’s what makes timing important. Bees (and butterflies, too) are most active in the late mornings through to early evening. Bees, especially, are susceptible to killing sprays. We need bees and other pollinators in our gardens to carry pollen from flower to flower. Without pollen spreaders, there will be no vegetables. Just because a product is organic does not mean it won’t kill the good bugs along with the bad bugs. If you see bees flying, do not use an insecticide, no matter how earth friendly it is. Be sure to look on the undersides of leaves and on the stems and at stem junctions. 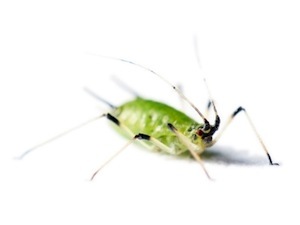 Pests know to hide while they do their chomping, so when you treat for a pest, be sure to hit those areas. Stay away from flowers. Birds, butterflies, and bees all visit these blooms. You need to protect them. Don’t ever spray directly onto flowers or flower buds. So, to grow organic foods, food you will be proud to serve your family knowing that there are no residues of potentially harmful products, check your garden daily, catch any problems early, and use the least amount of pest control at the right time of day.